The task of apologetics is not mainly the task of trained lawyers, theologians or philosophers. It is the task of ordinary Christians living an ordinary Christian life. For who is going to harm you if you are devoted to what is good? But in fact, if you happen to suffer for doing what is right, you are blessed. But do not be terrified of them or be shaken. But set Christ apart as Lord in your hearts and always be ready to give an answer to anyone who asks about the hope you possess. Yet do it with courtesy and respect, keeping a good conscience, so that those who slander your good conduct in Christ may be put to shame when they accuse you. For it is better to suffer for doing good, if God wills it, than for doing evil (1 Peter 3:13-17). That little word in verse 15 is what we are talking about. It is variously translated ‘defense’, ‘answer’, or ‘explanation.’ Though some people talk about apologetics in relation to the law courts (often talking about Socrates making a defense in a court), Peter has no such idea in his mind. Peter thinks we should all be doing this work as we live godly lives and sometimes experience opposition for what we believe. Apologetics is part and parcel of obedience to Christ displayed in a godly life. 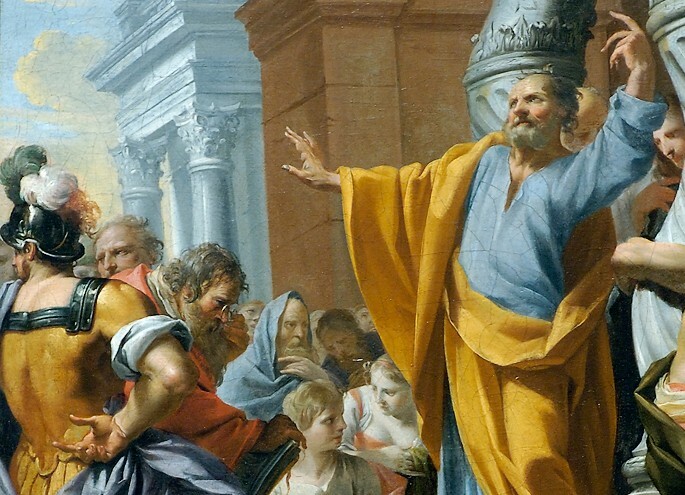 Peter assumes that those doing apologetics are those living in obedience to Christ and doing good. They have ‘set apart Christ as Lord.’ So, the task of apologetics is carried out by people who living in obedience to God's word. Apologetics is not the task of using long words; it is the task of using godly words that explain your godly life. So, what are the godly tasks of apologetics? First, we need godly preparation. Peter thinks that one of those obedient acts Christians are supposed to do is preparing to answer, explain, and defend the truth of the Bible. Apologetics takes work (…and always be ready to give an answer…). The kind of work required is preparation to answer questions from people who don’t understand and might be hostile. Some people are put off from apologetics because it is too difficult. But just as saying that only lawyers do apologetics is wrong, so it is also a mistake to think that apologetics is too difficult for ordinary Christians so we may as well leave it to the lawyers. We wouldn’t say this about anything else. Just because learning the Bible, or learning how to change a sinful habit, or learn to love someone we don’t get on with, or any other part of the Christian life is a difficult task, this does not mean we should avoid it if God is asking us to do it. Though we don’t have to be lawyers or philosophers to answer those questions, the church needs people to help us, those people who have perhaps done extra work in this area in order to help us obey God. Second, we need a godly answer. So, what is the answer we are supposed to be giving to those who ask? Simply put, the answer we are supposed to give is to the question: what is the explanation or an account (λόγον) of the hope you have? The answer we give should in some way provide an answer by pointing to the truth of the word of God, specifically, the good news about Jesus Christ who, as Peter points out, is our hope (1 Pet 1:3-9). Finally, we need a godly manner. Peter also thinks that even when we do apologetics we should be doing it in a godly manner. We should treat the person we are responding to with courtesy and, as we are speaking to them, we should not sin (we should keep a clean conscience). So, the task of apologetics is to (i) prepare answers to a plethora of objections that might be made to the Christian faith and (ii) to seek to point people to the truth of the word of God, specifically the hope we have in Jesus Christ, and (iii) not sinning as we do so.